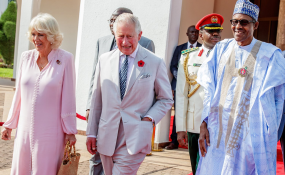 Abuja — The Prince of Wales, Prince Charles, and his wife, Camilla, the Duchess of Cornwall, arrived Nigeria Tuesday on a three-day business and cultural tour. "It's about the link, it's about the historic ties between Nigeria and UK," Arkwright said. "We are looking for ways in which we can mediate to bring reconciliation in the middle belt of Nigeria. This is so important as the conflict is not a religious one and not a conflict between Christians and Muslims."